Want to try out singlespeed racing but don’t want to go all in on a new set of wheels? Surly now offers a single-speed spacer kit that allows you to use single-speed cassette cogs on the freehub body of your multi-speed Shimano cassette-compatible hub. With the supplied selection of anodized aluminum spacers, you can attain a perfect chainline to compliment your road, track, or mountain crankset. Our large-diameter stainless steel cassette lockring holds everything together and perfectly matches the outside diameter of the spacers. Plus, it matches the machined shoulder of our single-speed cassette cogs (not included). 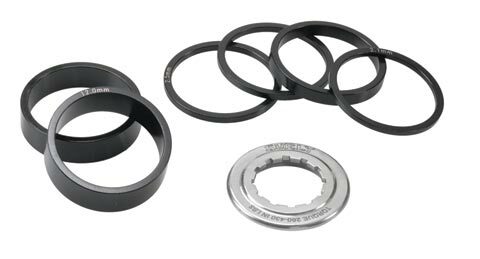 The lockring is machined to utilize a common Shimano cassette lockring tool for installation and removal. This isnt just a mix of off-the-shelf parts; we went the extra distance to give you a kit that will provide maximum functionality, durability, and aesthetic value.